TREVOR Muhlhan drives a Kenworth T408 for Ball Refrigerated Transport of Brisbane and was carrying parcels from south to Cairns when we saw him on October 21. "I have a backload of bananas to pick up at Tully on the way back for Melbourne," he said. The 64-year-old Trevor was relaxing at the BP Cluden and was delighted to have a yarn. His favourite stop off is the Caltex at Gilgandra in NSW and he dislikes travelling on the Bruce Hwy. "Especially between Gin Gin and Rockhampton, where it is rough," he said. Outside work he enjoys building computer systems. Trevor likes the Kenworth which is powered by 600hp Cummins engine and has a standard 18 speed gearbox. 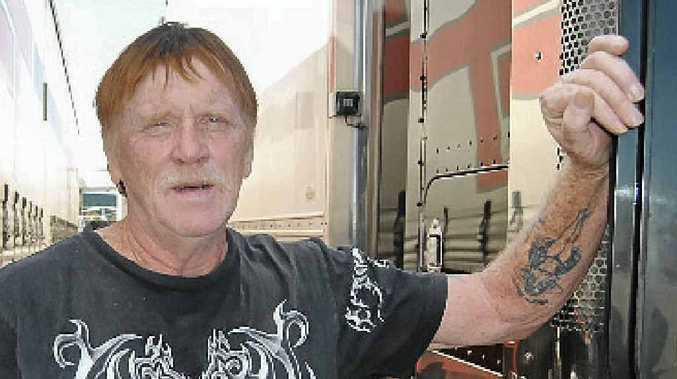 "I have been a truckie for more than 30 years," he said.